The Skinny: Crouching Tiger, Hidden Dragon director Ang Lee crafts a tense psychological drama about repression, anger, and childhood trauma that just so happens to star an angry green goliath with torn purple pants. Although much maligned during its theatrical release, Ang Lee's ambitious interpretation of the Marvel Comics character definitely merits a long second look. Released to mixed reviews and disappointing (but still respectable) box office numbers in the summer of 2003, Ang Lee's other "Green Destiny"more commonly known to the public as Hulkmerits some serious reevaluation upon video release. Despite the bad buzz surrounding the movie, Ang Lee's take on the not-so-jolly green giant defies expectations, resulting in a solid, if sometimes too serious retelling of the Hulk's origin story. The end product may not make for thrilling escapist entertainment, but the film still ranks as one of the better comic book movies to ever come out of Hollywood. The story centers on Bruce Banner (Eric Bana), a repressed, all-around nice guy scientist who's just broken up with his sometime girlfriend and longtime co-worker, Betty Ross (Jennifer Connelly). Together, they've been working on cutting edge nano-med experiments, the results of which they hope will benefit humankind. But after a freak lab accident, Bruce is bombarded with gamma rays and soon begins to experience some strange side effects. Namely, when he gets angry, he turns into an emerald behemoth prone to smashing anything and everything that gets in his way. Ultimately, it turns out that all of Bruce's problems stem from the unethical scientific experiments of his long-lost father played by a nutty Nick Nolte, who only looks slightly better than the now-famous mugshot of him released to the public not too long ago. To add insult to injury, Betty's smarmy ex-boyfriend (Josh Lucas) enters the picture to steal the duo's technology out from under them, as does her domineering military father (a great Sam Elliott) who has a mad-on for all things named Banner. All these stressors simply fuel Bruce's rage, inevitably transforming him into the Hulk on various occasions. Needless to say, plenty of people, places, and things get fragged along the way as Betty tries to unravel the secrets of Bruce's past before it's too late. Although some critics would fault Lee for taking the source material a bit too seriously, it's refreshing to see a filmmaker give the Hulk mythos, and the metaphors attached to it, an almost reverential treatment. Until recently, comic book properties rarely received the proper respect they deserve, oftentimes resulting in low budget disasters (Captain America) or ridiculously overblown camp (Batman and Robin). Staying true to the comic while at the same time adding his own touches here and there, Lee extrapolates not only on the decades-old origin story, but also the work of "Incredible Hulk" comic book writer Peter David. Lee uses the thorny father-son relationship David established during his heralded run as a jumping off point for all the psychological baggage unpacked in Lee's film adaptation. The impact of childhood wounds on present day existence, the danger of repressed emotions, how to deal with anger management issues, sorting out relationships between fathers and their childrenall of these things play out in typical slow-burn Ang Lee fashion, which should come as no surprise to those who've seen such past Lee films Sense and Sensibility and Crouching Tiger, Hidden Dragon. Instead of completely mindless drivel, the director aspires to give the audience something a little bit weightier. With a heavy emphasis on close-ups, the film maintains an intimate feel throughout; a trait that probably plays out a little better on the small screen than it did theatrically. Lee commands some strong performances out of his already talented cast with supporting actor Sam Elliott being one of the standouts. Whereas others might do some serious scenery chewing to make General Ross into a warmongering blowhard, Sam Elliott (along with the scriptwriters) firmly roots the character in reality, giving him a sense of humanity and a clear moral perspective that prevents him from deteriorating into yet another mustache-twirling villain. His performance serves as a prime example that Lee doesn't share stereotypical notions of what a "comic book movie" should be. If there's one performance that is perhaps lacking, it's that of the Hulk himself. 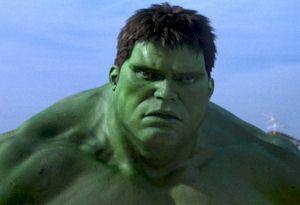 The computer graphics are at times brilliant, but ultimately the Hulk fails to establish a clear emotional connection with the audience. It's still a step up from Lou Ferrigno decked out in green grease paint, and as far as digital creations go, the Hulk certainly outpaces longtime internet whipping boy Jar Jar Binks in terms of likeability. But in the end, the Hulk still falls behind current CGI marvel Gollum in terms of performance, design, and sheer believability. For a computer generated character to function as a believable character among real, live actors, the design and performance quality have to be near perfect, something that Lee notoriously strived for (He often complained that the Hulk look faked during the design process, much to the dismay of the animators), but failed to execute. Herein lies the problem of Lee's ultra-serious interpretation of the character: without a believable Hulk to root for, there's little payoff for all the psychological wrangling that leads up to the transformations. To his credit, Lee maintains an overall feeling of repression throughout the film to mirror Bruce Banner's own emotional journey. However, the film doesn't capitalize on that buildup because it neglects to deliver a truly satisfying outlet for that onscreen rage. The audience should be feeling a certain sense of vicarious liberation in the character's "HULK SMASH!" hysterics, but somehow that feeling never manifests itself in any kind of escapist fun. Notes:  Ang Lee "played" the Hulk via a motion-capture suit.  Comics legend Stan Lee and Lou Ferrigno, the former star of "The Incredible Hulk" TV show, cameo as security guards in the film.  A poster for Ang Lee's Eat Drink Man Woman appears in the background of one scene.